Author Mark Bittman believes that, “Anyone can cook, and most everyone should.” In How to Cook Everything: The Basics he takes his winning formula from his award-winning guide How to Cook Everything, and scales it down to create the perfect cookbook for beginner cooks. How to Cook Everything: The Basics is a complete starter set of 100 recipes, from basic burgers, salads, pastas, and other staples to easy versions of classics like coffee cake and special occasion dishes. Basic Meat Loaf, Shrimp Cocktail, Linguine with Fresh Tomato Sauce and Parmesan… the dishes are all easy to prepare, recognizable, and appetizing. All are for home cooks who want food that is both good and healthy. 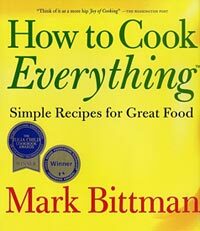 Mark Bittman is as wonderful a writer as he is a teacher and experienced cook, his instructions and recipes are always clear, straight to the point, engaging, and easy to follow. And, where words won’t suffice, he includes some handy illustrations of core techniques. How to Cook Everything: The Basics is an ideal gift for novices cooking their way up to the more extensive How to Cook Everything.